In this lesson we will look at how to determine whether a Trigonometric Function is Even, Odd or Neither. What is an even function? 1. An even function is symmetric about the y-axis. What is an odd function? 1. An odd function is symmetric about the origin. 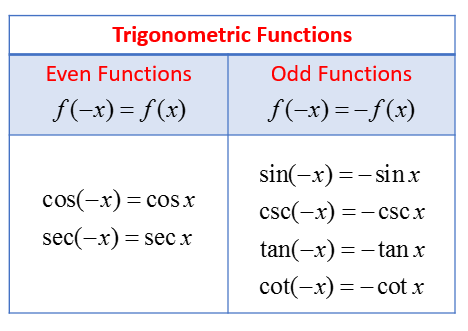 The following table shows the Even Trigonometric Functions and Odd Trigonometric Functions. Scroll down the page for more examples and step by step solutions. How to use the even-odd properties of the trigonometric functions? Example: Find the exact value using even-odd properties. How to determine trig function values based upon whether the function is odd or even? If cos(x) = 0.5, then cos(-x) = ___. If sin(x) = 0.15, then sin(-x) = ___. If tan(-x) = -3, then tan(x) = ___. If sec(-x) = 1.4, then sec(x) = ___. How to use even or odd properties to evaluate trig functions? Evaluate the trigonometric function by first using even/odd properties to rewrite the expression with a positive angle. Give an exact answer Do not use a calculator.